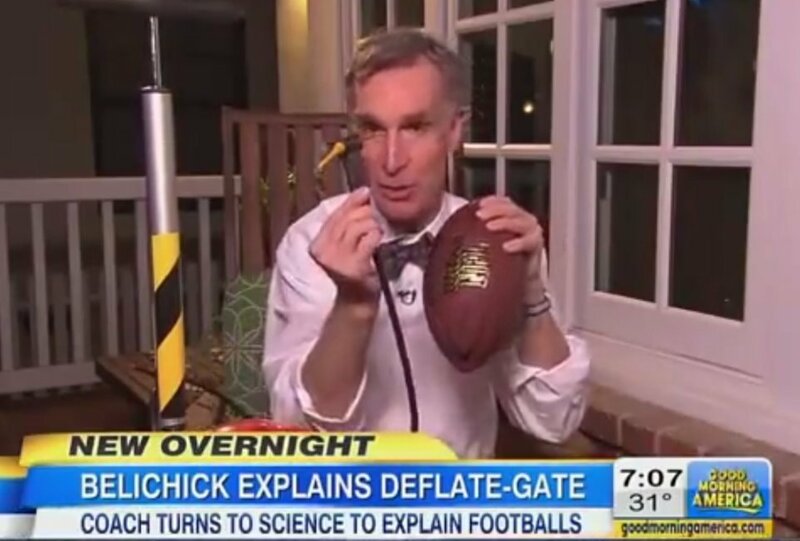 Count Bill Nye among those who aren’t buying the scientific explanations Bill Belichick is cooking. “I’m not too worried about coach Belichick competing with me,” Nye said, referring to the Internet dubbing Belichick “the science guy” after the coach's complicated Saturday press conference. “What he said didn’t make any sense." Belichick said during the press conference that after carefully studying the issue, he had concluded that his team acted in accordance with NFL guidelines. Belichick blamed the deflation of the team’s footballs on factors including “atmospheric conditions” and the team’s process of rubbing footballs before the game to wear them in, per the preference of the team’s quarterbacks. But Nye, for one, wasn’t buying the idea that a little rubbing can deflate the football in any significant way. But there's one thing you should know about Nye: It appears he's a Seahawks fan. "I cannot help but say, 'Go Seahawks!''' he admitted to "GMA." ESPN reported last week that the NFL had found 11 of the Patriot's 12 footballs were significantly under-inflated during the AFC Championship Game against the Indianapolis Colts. None of the footballs provided by the Colts were under-inflated.